The Ford Escape is a four-door, five passenger sport-utility vehicle. The Ford Escape sport utility vehicle debuted in 2001 as a smaller alternative to the full-sized Explorer and king-sized Expedition and Excursion SUV’s. The vehicle was designed to compete with the Honda CR-V and Toyota RAV4, despite being larger than either of those ‘cute-utes’. The Escape was based on the same car platform that had underpinned the Ford Contour, and as such the vehicle boasted a ride that was far more car-like than the other truck-based SUV’s in Ford’s showrooms. In 2008, the Escape was restyled and refreshed, although mechanically it remained very similar to the previous year’s model. The exterior appearance of the Escape was somewhat rounded off, and the front end of the vehicle was re-cast to bear greater similarity to the other trucks in the Ford stable – especially with regards to the headlights, which now curved up and into the front fenders. This new look helped further position the Escape as a slightly larger alternative to its Japanese competitors, while remaining within the same price segment. Starting at $19,140, the entry level Escape XLS is motivated by a 153 horsepower, 4-cylinder engine, with the option of either a 5-speed manual or 4-speed automatic transmission. Upgrading to the Escape Limited allows buyers to enjoy 200 horsepower from a 3 liter V6. Each of these engines offers some of the best fuel economy in their class, with 28 highway miles per gallon for the 4-cylinder and 22 for the 6. However, for those who are interested in paying substantially less at the fuel pump, and also doing their part to reduce carbon emissions, there is the Escape Hybrid edition. 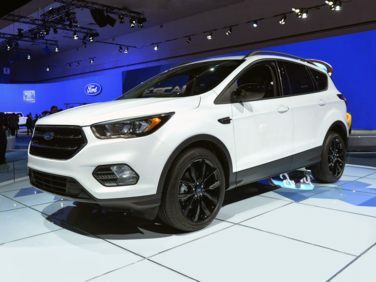 While the Hybrid does cost a bit more than any other version of the Escape, its 133 horsepower engine works together with a 94 horsepower electric motor to reduce fuel consumption, resulting in 34 miles per gallon in the city and 30 on the highway. These are impressive numbers for a sport utility vehicle. The electric motor can be used to exclusively power the vehicle up to around 35 miles per hour, with the gasoline engine kicking in there, as well as when it comes time for heavy acceleration. The base level Escape is offered in front-wheel drive, while 4-wheel drive is an option on higher trims. In terms of interior features, the Escape provides seating for 5, and interior storage and cargo space is above average. The 2008 Escape has a quieter interior than in previous years, thanks to using higher quality acoustic materials. The seats are also made from 100% recycled cloth fiber, adding an extra element of environmental cachet to the platform. For 2009, upgrades are available across the board, with a larger base engine and an updated version of the 3.0 liter V6 producing substantially more horsepower. Even the Hybrid will benefit from a new gasoline motor. Ford claims that these new engines will achieve better fuel mileage than their previous editions. The SYNC entertainment system, produced in collaboration with Microsoft, will also become a standard feature across most trim levels. The 2009 Ford Escape uses the same platform as the 2008 model, but several changes have been made to the vehicle’s drivetrain. The Escape is available in XLS Manual, XLS, XLT and Limited trims. The base XLS Manual uses a new-for-2009 2.5 liter 4-cylinder engine that produces 171 horsepower and 171 lb-ft of torque, mated to a 5-speed transmission. The Escape XLS, XLT and Limited use the same engine but substitute a 6-speed automatic transmission. Fuel economy is rated at 22 miles per gallon in city driving and 28 miles per gallon on the highway for the front-wheel drive editions of the SUV. The XLT and Limited also have the option of upgrading to an improved version of Ford’s 3.0 liter V6 that produces 240 horsepower and 233 lb-ft of torque, a 40 horsepower upgrade over 2008’s 6-cylinder. The motor is also more efficient than in years past, turning in fuel economy rated at 18 miles per gallon in the city and 24 miles per gallon on the highway. This engine makes use of a 6-speed automatic transmission. All versions of the 2009 Ford Escape can be ordered with four-wheel drive, with the exception of the XLS Manual. The 2009 Ford Escape is also available in a Hybrid edition that has seen similar mechanical upgrades when compared to the 2008 model. The Escape Hybrid, available in both base and Limited trim now uses a 153 horsepower, 2.5 liter 4-cylinder engine matched with a 94 horsepower electrical motor. Fuel mileage for the front-wheel drive edition of the vehicle is 34 miles per gallon in the city and 31 miles per gallon on the highway, while choosing optional four-wheel drive drops economy to 29 miles per gallon in the city and 27 miles per gallon on the highway. The 2009 Escape Hybrid uses an electronically-controlled continuously-variable automatic transmission.